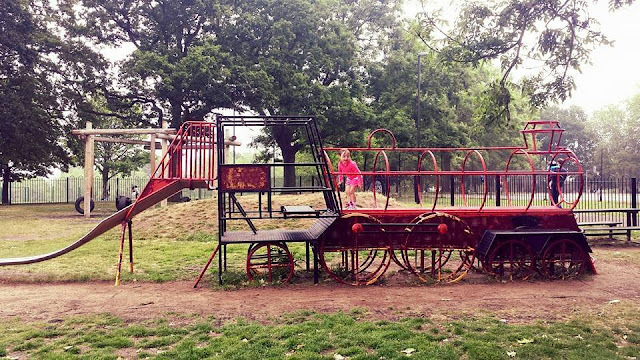 Hilly Fields consists of open, grassed areas with scatterings of trees and can be found in-between Ladywell and Brockey in South East London. One thing I really like about the name of this place is that it is completely honest and you certainly get exactly what it says on the tin. It's hilly and it has fields (of grass). It's quite an interesting place and as you wander around you'll come across lots of quirky and/or arty things that'll make you smile. Back in 2012, the area became home to Hilly Fields parkrun. I attended the inaugural [blog here] and a special Christmas Day event [blog here] in that same year. It's a great event in a great location and always in my mind to visit again. Actually, I did offer to be a pacer a few weeks before writing this blog so I do have a very good reason to go back. I was very excited when I heard that a junior event would be starting at the same venue. The main meeting point is next to the Pistachios in the Park cafe, which is pretty much at the highest point of the park. Car parking is possible on most of the side roads surrounding the venue and leaves just a short walk where you can admire the views towards Crystal Palace in the south or the city of London to the north. If travelling by train, Ladywell is the closest station, but Brockley and Crofton Park stations are also fairly close-by. As with all parkruns, the proceedings started with the runners' briefing. 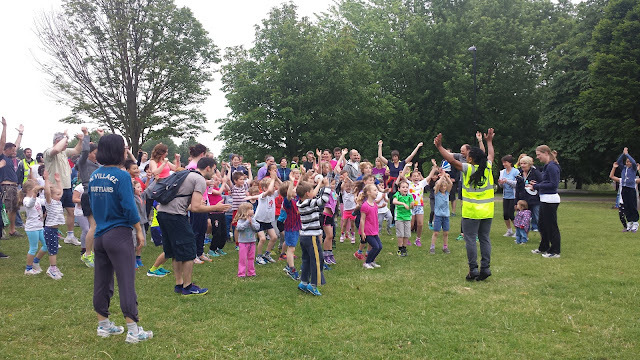 It was different to any other I remember witnessing before and if I was to ever give a briefing at a junior parkrun I would certainly take a lot from what I saw here. 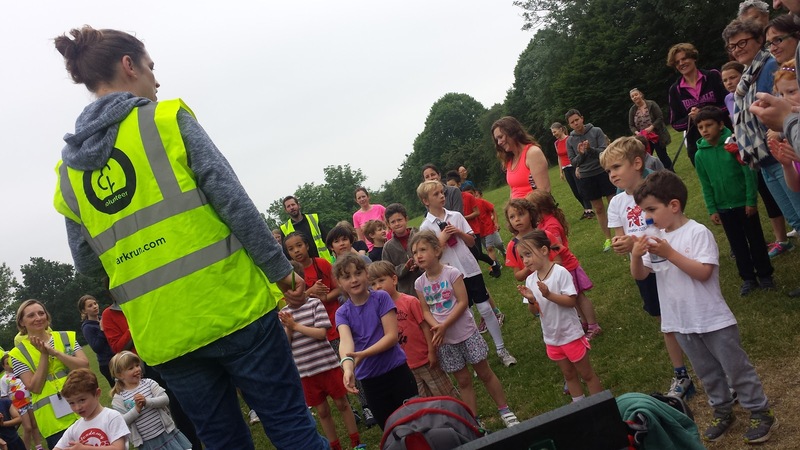 Instead of just relaying a list of 'dos and don'ts', the run director, Lisa, spent the entire briefing interacting with the children - asking questions like 'how many laps do we run?' (2!) and 'who mustn't cross the finish line?' (grown ups!). Run briefings can be tedious and children can easily lose interest, but here that was simply not the case. The children were fully engaged the whole time - absolutely brilliant! After the briefing, it was time for the legendary junior parkrun warm-up session. Again, at this venue it seemed to have an extra edge. The volunteer leading the session made it energetic and most importantly, FUN! Matilda loved it and I found myself in complete awe - again, brilliant! 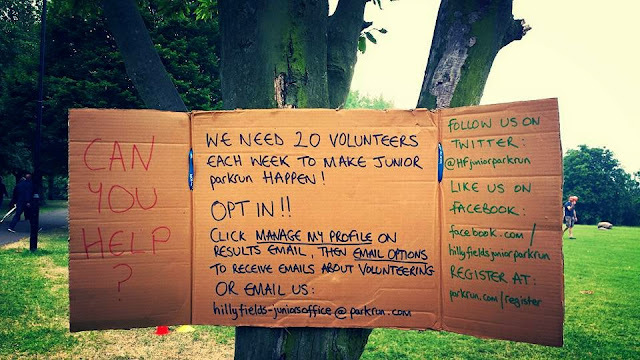 Junior parkrun start times vary between venues. This one starts at 9.30am and takes place on a mixture of tarmac paths and grass over two laps of the northern section of the park. The start is in almost the same spot as for the 5k event (on the path outside the cafe) and sees the runners heading off in a westerly direction towards Montague Avenue. At the end of the path the course swings to the right and the runners head downhill..
At the bottom of the path, the course transfers to grass and the runners follow the perimeter of the park adjacent to Hilly Fields Crescent until transferring back onto the tarmac path which now heads back up the hill towards the cafe. 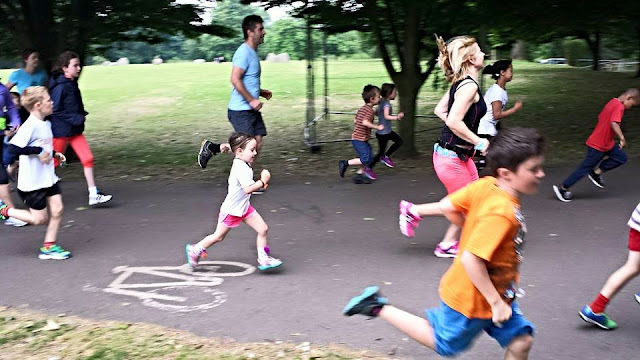 It was at around the 800 metre point that Matilda had a little accident by tripping over (I'm sure she has started her own parkrun tourism sub-category: Most accident reports at different venues!). Anyway, she grazed her knees, one of them was bleeding and she was very upset. She decided not to carry on running so we headed up to the start-finish area where we found the Run Director, Lisa, who had access to a little first aid kit (thank you). I cleaned Matilda's knees with some antiseptic wipes and we sat down while the rest of the runners completed their first lap and turned right to start their second. At the end of the second lap, the runners continued to run straight and entered the finish funnel to pick up their finish tokens and then get their personal barcodes scanned. We headed off into the cafe to cheer Matilda up with some fresh mini pastries and a drink. It was a shame that after being so keen to try a new venue that she came away with a DNF. However, she has vowed to return at some point to complete the run. Matilda's reputation must have preceded her as it was while we were in the cafe that Lisa (RD) came over to check if Matilda was ok, and then said something along the lines of 'I didn't realise that you were THE Matilda!' in reference to reading about her here on blog7t, which really made our day! She also included Matilda in the week's run report, which was very nice indeed. After this, Matilda felt much better and while I headed off to use some of the park's exercise equipment, Matilda popped into the playground with her mum. Once I had finished, I joined Matilda for a game of pirate treasure hunt where I came away with a whole bag-full of gold and a few diamonds which was pretty damn good. Just like Hilly Fields junior parkrun.